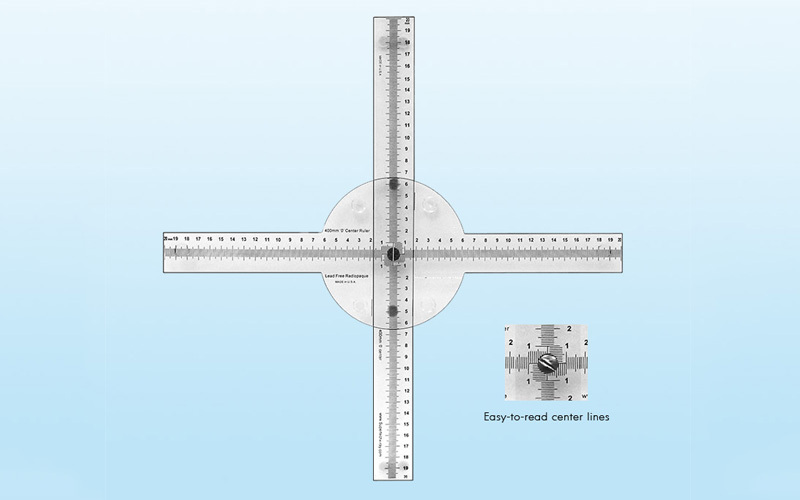 Set of 400 mm "0" center cross-shaped rulers on a center aluminum pin. The center is designed to easily read all 200 graduations in all directions from center, with no graduation overlap. The set swings open for use and closes for storage in the case. The base ruler has a built-in stabilizer with clear rubber feet to keep its position on the image receptor. A set of lines on the base helps the user quickly align the rulers at 90° to each other. Felt bumpers keep the rulers from scratching each other.